Scientists and engineers are working on new metallic alloys all the time. This is due to modern-day industrial design, and the consistent intensity in demands for materials that are lightweight, yet strong and durable. At the same time, the manufacturers of cars, aeroplanes and other such machines also value materials that are perceived as trustworthy, yet high-end and state-of-the-art, by both industry insiders and typical consumers. Therefore, research into new compounds that contain elements such as aluminium, titanium and chromium is constantly progressing, and attracts interests from various parties with various needs. However, even the newest and ‘best’ alloys, including Inconel, aluminium-magnesium alloys and CoCr, are not compatible with what may be the best manufacturing process for the frames of the vehicles people want to make out of them. This process is additive manufacturing, a form of 3D printing for metal-rich compounds. However, a team at HRL Laboratories have overcome this issue: they have developed an aluminium alloy that can be 3D-printed. Their new alloy may lead to the design of lighter planes and cars one day, with the added benefit of superior strength and flexibility in terms of shapes the new metal can take. Additive manufacturing is a process in which metal is laid down in successive layers that are built up into a specific structure through variations in these layers, just as a 3D printer lays down plastic filament into a pre-defined conformation. However, even state-of-the-art alloys, including cobalt-chrome, AlSi10Mg, Inconel 718 and TiAl6V4, can’t be incorporated into additive manufacturing, despite the apparent advantages of combining the two. These alloys react poorly to patterns of heating and cooling; it leads to the formation of large, irregular particles (known as ‘grains’) within these metals at the molecular level. This is due to properties such as the silicon content in AlSiMg alloys, which tend to accrete into larger particles in response to treatment with heat. This phenomenon has been found to increase the fracture strain of an alloy by nearly 20%, while also considerably reducing its tensile strength, in experimental conditions. Uneven or uncontrolled grain formation is linked to the increased risk of progressive cracking in the metal as a whole. 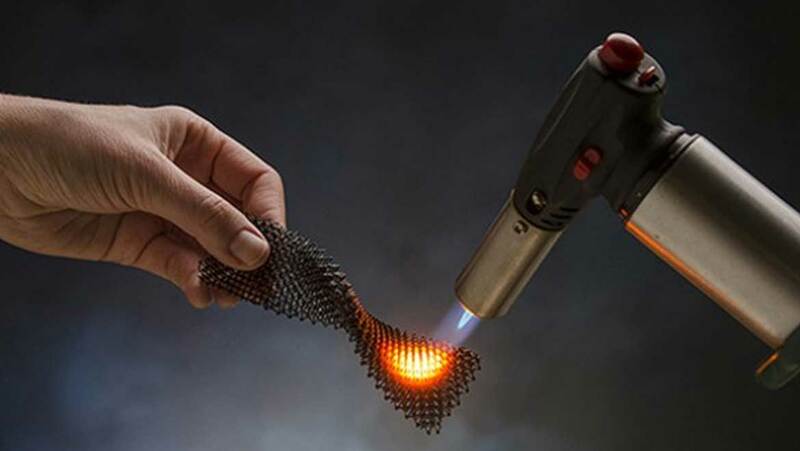 Considering that additive manufacturing also involves selective melting with lasers to achieve the desired shape, it is easy to see why novel metals have come to pieces after being put through this process. In addition, these high-tech alloys can’t be welded, as they would again be too susceptible to cracking on re-solidifying. On the other hand, additive manufacturing would afford a range of advantages for those in industrial design, fabrications and production. It may reduce or even negate the need for the veritable smorgasbord of rivets and other physical connections found in modern-day machines, particularly aeroplanes. 3D-printed frames would be unified, standalone pieces that could enhance structural integrity while also shedding at least some weight, so long as the alloy used was also flexible enough. They may also be more fluid and permissive in terms of the shapes they could take, which is often constrained by factors including the material available to manufacture with. Obviously, other designs would still require joined parts; in these cases, 3D printing could provide components quickly and easily. This is why a team at HRL Laboratories in Malibu and the Materials Department of the University of California at Santa Barbara set out to prove a theory of how alloys could be used in additive manufacturing. This theory states that the inclusion of another, possibly non-metallic, element into an alloy would control grain formation in the course of melting and subsequent solidification. This should promote a more even grain size throughout the alloy and thus decrease the risk of fractures. The team at HRL/UCSB chose zirconium as this additional element (which is termed the ‘nucleant’) and incorporated it into powdered 6061- and 7075-series aluminium. They put this new compound through a process that included selective laser-melting steps, and found that their new compound was resistant to cracking while also retaining an appreciable amount of strength. This was achieved because the grains in the material were much more constant in terms of physical dimensions, and also finer compared to those found in other, non-nucleated alloys. The team, led by John Martin and Tresa Pollock, also assert that their method is applicable to other alloys so as to make them compatible with additive processes. It could allow manufacturers to combine the forms of aluminium as above with other “non-weldables”, as well as other compounds such as intermetallics, into the same design with a unified 3D-printing procedure. The team also believe that their breakthrough will also allow for the integration of multiple manufacturing techniques, including various forms of deposition, into the production of a single frame or part. There are over 5,000 high-strength alloys in use by industries such as automotive and aeronautical manufacturing today, few of which can tolerate being welded or melted without developing periodic cracks. This new method of alloy configuration, as demonstrated in a paper published in Nature Letters on the 20th of September 2017, could revolutionise the use of metal alloys in the manufacture of vehicle frames. This may reduce the weight of these machines while retaining the strength of the metals in the alloy, which in turn could optimise fuel use, structural integrity and durability. This new technique of adding zirconium as a nucleant may also be cost-effective, as that material is relatively cheap and abundant. The ability to combine 3D-printing and metals such as aluminium also implies other new possibilities, especially that of easing the dependence on and use of plastics as the technology becomes more commonly available. Top image: Photo by Dan Little Photography. © 2015 HRL Laboratories. Martin JH, Yahata BD, Hundley JM, Mayer JA, Schaedler TA, Pollock TM. (2017) 3D printing of high-strength aluminium alloys. Nature. 549:(7672). pp.365-9. Li W, Li S, Liu J, Zhang A, Zhou Y, Wei Q, et al. (2016) Effect of heat treatment on AlSi10Mg alloy fabricated by selective laser melting: Microstructure evolution, mechanical properties and fracture mechanism. Materials Science and Engineering: A. 663:(Supplement C). pp.116-25.